It’s become a bit of an annual tradition for Opiate’s inspired Hobby Industries imprint to keep us on our toes by bringing us a couple of releases a year before retreating back into hibernation for a further 12 months. 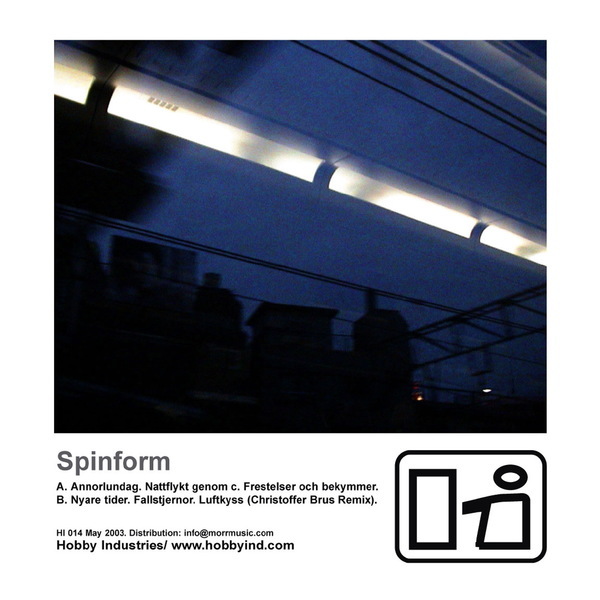 This year’s first installment comes to us courtesy of Erik Moller’s much-missed Spinform project. Erik fits-in perfectly with the Hobby aesthetic, managing to produce a sound that comes across as the perfect blend between Four Tet’s excellent “Rounds” album and Arovane’s seminal “Tides”. Opening track “Annorlunddag” flows with a skipping percusion, glorious double bass and evocative distant slide guitar – perfect midnight music. “Frestelser och bekymmer”, meanwhile, evokes the spirit of Satie with a breathtaking solitary piano displayed through the hiss of distance and age, dusty percussion follows suit and leads to a remarkable tug at the heartstrings, sublime lullaby tackle. “Nyare tider” opens the flip with a jazz break, that lilting piano emerging once again to fuse with dub basslines and the minutiae of electronic tinkling – sublime stuff. The EP ends with the gorgeous “Luftkyss ( Christoffer Berg Remix)”, introducing us to the protagonist of the next Hobby EP and a track that echoes with ambience, tidal waves and that perfected meeting point between organic acoustic flows and electronic execution. Gorgeous work, essential listening.